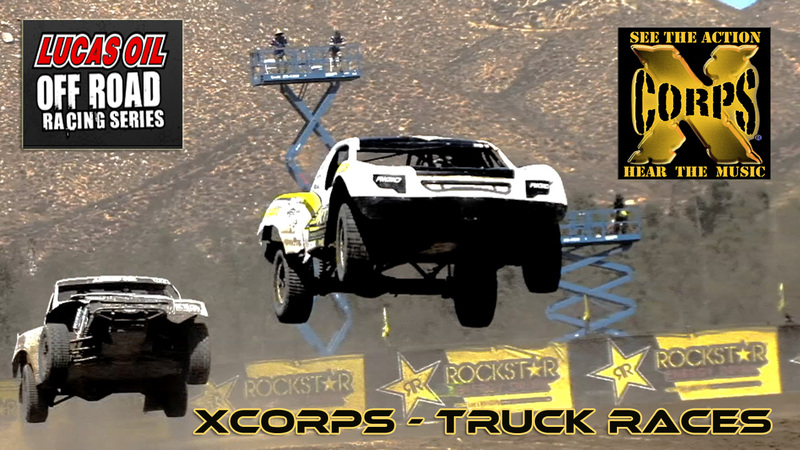 Xcorps TV productions presents a NEW video release with on camera host Rat Sult reporting on the wild bad to the bone sport of off road race action rolling at the historic Lake Elsinore California Motorsports Park track. In segment 4 of this special program the wild motorsports action continues with the best stadium off road truck drivers in the world launching their high horse vehicles off the dirt berms and jumps at the Lucas Off Road Racing Series event. For the music fueling this video the RIVE promoted musical artist from London MOOJI – doing the number “Don’t”. Check out the visual BIG AIR action here where the XCTV XCAMS follow the racing trucks and their extreme drivers taking their vehicles side by side airborne more than 20 feet in the air for unbelievable long distances! In fact the races seem to be airborne for half the race! 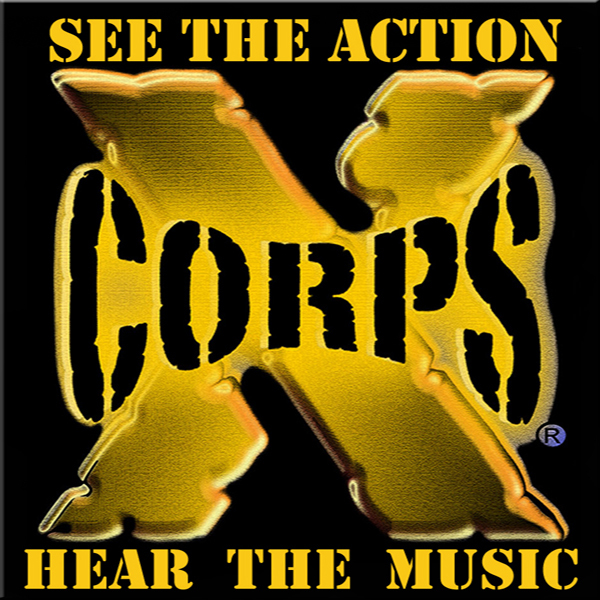 Race action Xcorps style! In this wild new motorsports episode starts with on camera host Rat Sult reporting at the Lake Elsinore track checking out the high powered off road style super shocked vehicles ready for some heavy pounding on the dirt! Music here by the band Disciples of Babylon (DOB) an international rock band based in Hollywood, California. The group was founded in 2012 and includes Eric Knight on lead vocals and rhythm guitar, lead guitarist Ramon Blanco, bassist Gui Bodi and on drums Chris Toeller. 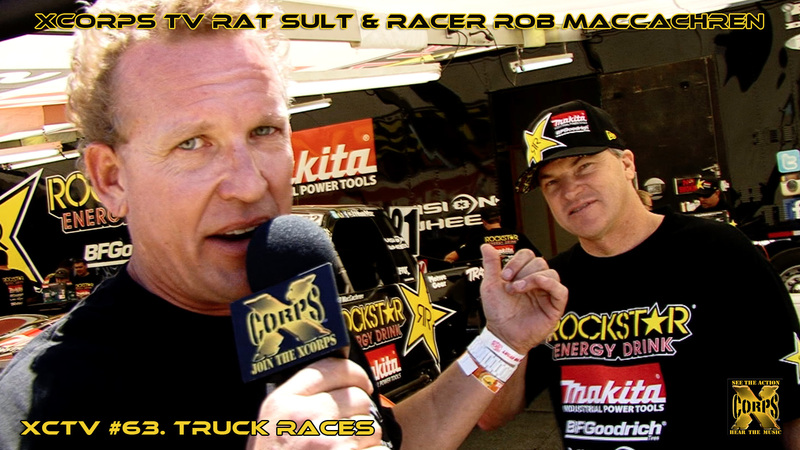 Rat heads for the pre race pits to get an eXclusive interview with one of the best of the off road racer commanders – Rob MacCachren – getting ready to fly his truck! Rat talks to ‘Rob Mac’ about how he has been doing in the Lucas Oil series and what the competition looks like! Check out his Rockstar Energy branded custom truck! Music to match the mood with a RIVE promoted band hailing from ‘ Sydney Down Under’ the now LA based alternative rock band SICK PUPPIES rolling out their new song ‘Stick to Your Guns’ off their FURY album release. Tight as all ding dong heck! Check out the mud slinging door banging race action shots cut to this bands new and very slick and live action music video! A well produced cool looking fast cut live performance style MV by Renaissance Man productions. The 3 members of Sick Puppies include Aussies Emma Anzai bass, vocals – along with drummer Mark Goodwin and now jamming lead vocals with the band is Texas born Bryan Scott. This XCTV worthy band knows how to get down with some heavy horse floor pounding riffs and just like these off road trucks come complete with a safe landing! Rat closes this adrenalized segment out with more trackside airborne truck race action and a ‘Stay Tuned throw’ from another wild man of the TV trade – Greg Houser from Lucas Oil Race TV! Segment 4 of this XCTV motor sports special jams into gear with off road trucks going airborne with thousands of horses destroying the Elsinore clay track yet again for the fans and the Xcorps cameras! This is the next generation of spectator motor sports! This part of the show race action is backed by music and video from RIVE promoted MOOJI doing the track “Don’t” from techno tunes producer KRAMNIC delivering a driving funky dub acid jazz music mix to the race action! By the way Mooji’s Big Brother themed video titled “Don’t” stands for Digital Oneirology Neuro Treatment…! Next Xcorps TV host Rat Sult shows up fully surrounded by the extremely lovely RockStar Energy Models for a stay tuned thro! Check these fine chicks out! Trackside Rat talks with Xcorps XCAM shooter Lisa Edmondson about the LOUD and knarly shoot conditions where the 800 HP trucks tires are kicking out high speed clay bullets! See what Lisa says of the Lucas Offroad Race shoot conditions! Rat rolls behind the scenes in the truck pits and talks with LOORS race veteran and now newly top seated in the Pro 4 Unlimited Lucas Offroad class racer Kyle Leduc driving Monster Energy truck 99. See what Kyle has to say about the races and and his plan to make money! Check out Kyle’s truck in action around the track! Special thanks to the Monster Energy Models, Rob MacCachren, Kyle Leduc along with Lucas Oil Race Director Ritchie Lewis.